Every year, there are teams looking for quarterbacks at the top of the draft to jump start their franchises. This year, with the stellar crop of defensive players and offensive tackles, there is a good possibility that a quarterback may not be taken in the first ten picks. As of the beginning of the combine, there were a few that had prospects of taking the place of players like Ndamukong Suh at the top of the draft. Out of all of them, Sam Bradford has emerged as the favorite with many teams in need of QB help. With the struggling Rams drafting at number one, the highly touted quarterback prospect out of Oklahoma has rocketed up the draft boards to become a potential number one pick. It’s been a rocky road for Bradford over the last year, ever since he declared that he was going back to school instead of taking his place next to former number one pick, Matthew Stafford, in last year’s draft. Coming off a huge year, he was expected to be at or near the top of the draft in 2009, but he instead decided to go back for another year, and another shot at a BCS championship with the Sooners. He played well for most of the season until a shoulder injury sidelined him for the latter part of 2009, causing him to miss bowls and workouts alike. This unfortunate injury seemed to have put his millions of NFL guaranteed dollars in jeopardy, until he showed up at the NFL combine 14 pounds heavier and looking stronger than ever. Although Bradford did not throw at the combine or do any of the drills, he improved his stock to the point where Jimmy Clausen now looks to be the number two prospect. The Rams have publically said that they love what Bradford brings to the table, and one draft insider has even reported that they are dead set on taking him at number one. There is still a lot of time between now and the draft (including Bradford’s pro day), but his college resume does put him in elite company. 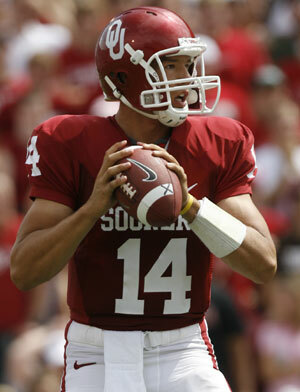 He has won almost every college award there is to win, including the 2008 Heisman. Bradford was dominant when he was healthy, frequently outshining top draft prospects like Colt McCoy and Tim Tebow in a few of the games they played. My thoughts on Bradford seem to match what a lot of other people are saying, as I believe he will be the best of the QBs taken in the 2010 draft class. He played in a pro-style offense, has a great throwing motion, and is turning into a beast at 236 pounds. Tim Tebow may have a “winning instinct,” but that means absolutely nothing when facing linebackers like Ray Lewis, Patrick Willis, and Jon Beason, or corners like Darrelle Revis. You need the tools to play, and Bradford encompasses each and every one of them. His shoulder may present durability questions, but as we saw with former Sooner Adrian Peterson, injuries can be inconsequential coming out of the draft. Upper Deck will make players like Sam Bradford a focus in the beginning of 2010, along with many of the other elite prospects for upcoming releases. 2010 Sweet Spot Football will be back with a new style and a new face, but will still feature elements collectors have loved for years. 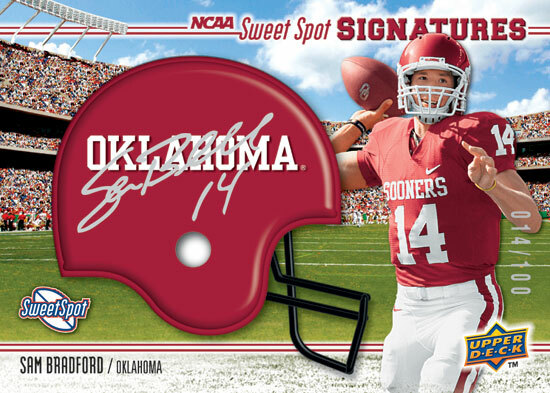 It will feature players like Bradford, Ndamukong Suh, Colt McCoy and others, on hard signed custom helmet cards. Sweet Spot will also debut players like Super Bowl MVP Drew Brees in his Purdue garb, and Hall of Famer Dan Marino in his Pittsburgh uniform for all the collectors out there who follow their favorite schools. Upper Deck Draft will also be back for its third year, with hard signed cards of all the top prospects and veteran stars. These cards have become immensely popular due to being some of the first cards and autographs of the 2010 season, and you can bet Bradford will be one of the top valued cards in the set. Check back on the Upper Deck Blog for more draft profiles leading up to the 2010 NFL Draft on April 22!